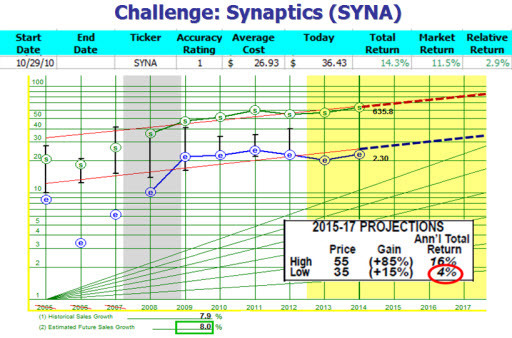 The Round Table knights decided to “sell” Synaptics (SYNA) from the Round Table tracking portfolio at the January session. 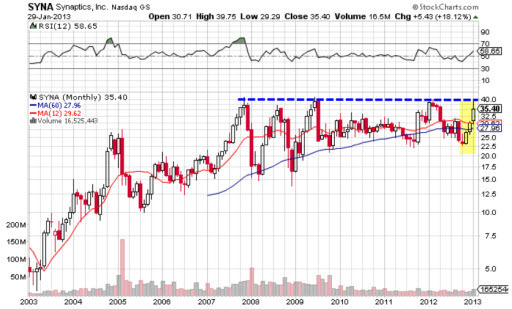 As shown, Synaptics was added to the portfolio back in October 2010 — and has outperformed the Wilshire 5000 since then. The stock price has moved from $22 to $36 over the last few months and in the absence of any large fundamental upgrades (growth or profitability forecasts) the return forecast has dropped to low single digits. We also note substantial potential resistance near current price levels. Note the substantial price move over the last three months.